When a woman was being attacked by a man with a knife, she had no idea a superhero was watching over her. That superhero was a stray Pit Bull who managed to get the attacker off of her. 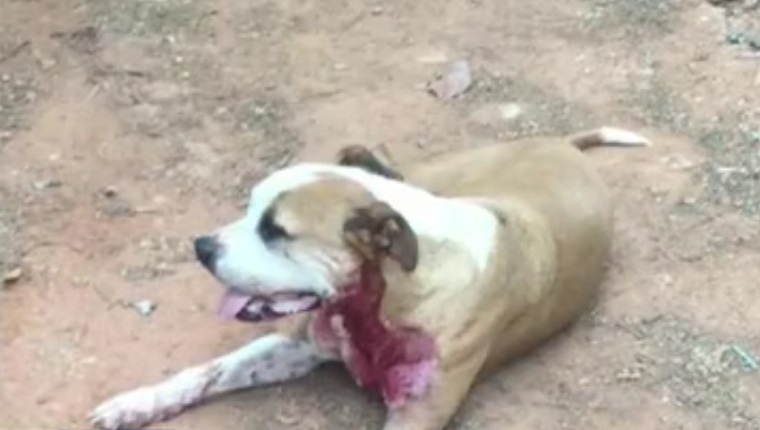 Unfortunately, the dog was stabbed five times before the man took off. When police arrived at the scene, the pup was in rough shape. The officers couldn’t let this dog who had fought so hard to save a complete stranger suffer or die, so they named him Hero and brought him to a veterinary surgeon for treatment. Hero almost died twice during surgery, but he fought through it and made a full recovery. A local Pit Bull rescue raised funds to cover his discounted medical bills. At the time of writing this post, Hero is at a rescue in West Knoxville, Tennessee, and he’s available for adoption. If you’re interested, you can find more information at www.fightingforthebullys.org. He has a bad front leg and a bad back leg, but he’s very laid back and obviously loves people. He’d make a very loyal member of the family. Would you consider adopting a dog like Hero? How far would your dog go to save your life? Let us know in the comments below!